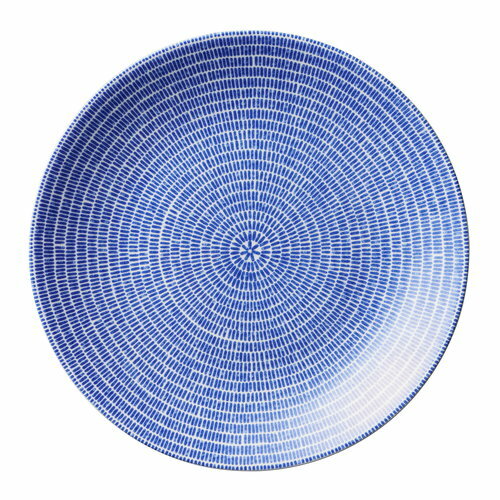 24h Avec plate by Arabia is adorned with a blue, circular pattern designed by Kati Tuominen-Niittylä. Arabia’s 24h is a range of ceramic tableware designed by Heikki Orvola, a versatile Finnish designer who has worked with a broad range of materials and created several Finnish classics. The 24h series, originally designed for Orvola’s own use, found its way into Arabia’s production in 1996 and received the Design Plus Award at the Ambiente International Fair in Frankfurt next year. The 24h range is characterized by a quiet and pleasant design, ideal for every hour of the day.